There are now more than 650,000 iPhone and iPad apps available. So how to download your favourite iPhone/iPad apps and games and install them? Going to iTunes App Store can be your choice, but Appandora also provides the function to install the downloaded apps and manage them freely and unlimitedly. Appandora supports all iPhone and iPad versions including iPhone 6/6 Plus, iPhone 5S, iPhone 5C, iPhone 5, iPhone 4S, iPad Air/2, iPad Mini/2/3 and iOS 8&7, which is well-designed for users who want to get unlimited apps and games for iPhone and iPad. Now you could try Appandora to get any apps and games to your iPhone and iPad for free! If you don't know how to free get games and apps for your iPhone or iPad with Appandora, just follow the simple step-by-step instructions given below and you are on track. * Computer which installed Appandora program. Note: * Make sure you have the latest iTunes version installed, if not install it or update it too. * Get the latest available Appandora for PC from the download page and install Appandora on your computer. 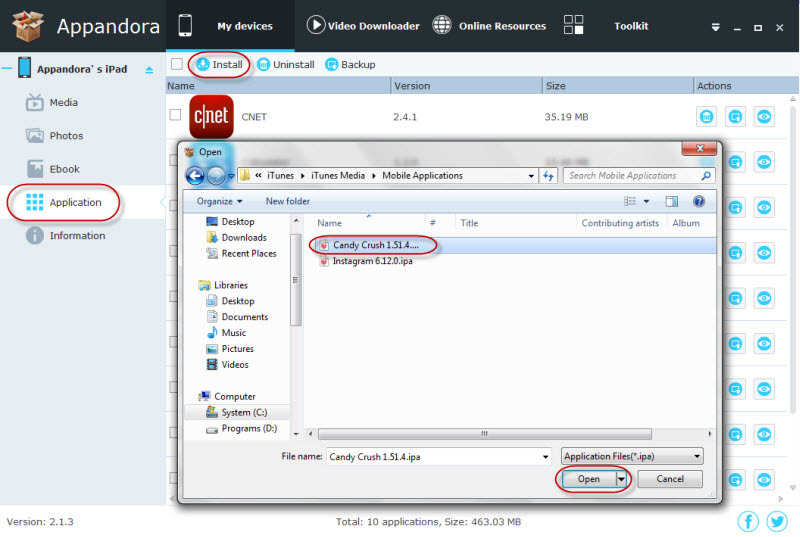 Step 2.Connect your iPad or iPhone via USB cable with Appandora. Then launch Appandora and the window of the program will show file contents of your iOS device automatically.